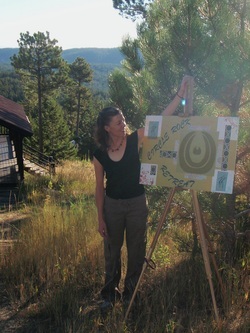 Molly has a Masters degree in Somatic Counseling Psychology from Naropa University. She runs body based therapy programs in various health care settings and has experience facilitating groups for children, teens, adults, senior citizens and care-givers. Her work is based on the philosophy that each individual contains their own resources for growth/healing and that direct experience helps reveal these resources. Her primary focus is body based psychotherapy, but has also worked in arts/recreation administration, performance, and dance outreach programs. Molly feels deeply blessed to work in the wilderness environment at Circle Rock. "Working in the woods helps us shed habitual patterns and encourages a return to our own essential rhythms. Having a dance/movement space in the woods allows exploration of relationship to your environment, other people and yourself." Compassion, creativity, movement, integration and relationship are some of the elements that Molly hopes to foster at Circle Rock. Shannon Phelps was born in northern California, but has spent most of his life growing up in the small town of Kalispell Montana on the boarders of Glacier Park and the edges of Flathead Lake. An early fascination with nature and a born kinship with animals and birds helped direct Mr. Phelps in finding his path in life as a Land Steward and Environmental Manager. Shannon has a wide range of experience and education investigating the impacts of human industrialization and how to reclaim disturbed and contaminated landscapes. He received his Masters’ Degree in Land Rehabilitation from Montana State University in 2002 and has since continued his focus on the environmental assessment of animals, plants, soils, and water quality. Currently, he lives with his wife, two cats, and seven fish and is the owner and operator of an environmental services laboratory outside of Boulder, Colorado. Circle Rock is lucky to have him watching over our land! The name Circle Rock comes from a memorable campfire story. The tale is wonderful and perhaps it will be told again some day. In the meanwhile, we wish to invite the telling of and listening to all kinds of stories. We celebrate the tradition of people of all places and times who gather in circles and share.